Once again Goodreads 5-star system fails me, as this is a solid 3.5 star effort for me. 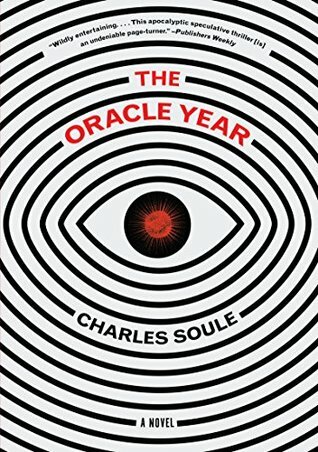 But if I have to choose between 3 or 4 stars, I'll go with 3, because while I enjoyed the ride, there are some flaws in The Oracle Year that bring down the overall experience. Will Dando's friend, Hamza, starts orchestrating selling certain predictions by offering 10-minute chunks of time to corporate interests looking to get a leg up on the competition. Soon the pair of friends has amassed literally billions of dollars. But Hamza presses on, saying they need more before they can reach a point where they will be completely secure. This didn't strike me as particularly believable, but even if it is, the morality of what Will and Mamza are doing is only treated in a weird, offhand manner. Will is unhappy, but doesn't stop the pointless accumulation of more money than he could ever use. His friend, Hamza, seems to have no reason to be best friends with an ordinary, struggling musician, but at least has a convincingly obsessive, detail-oriented personality. This also touches on another issue--Will Dando is not a very interesting person. He is a loner (apart from Hamza and Miko, his wife) and spends most of the story trying to avoid people and relationships. He has no real arc, no growth. He starts out bland and unremarkable, and ends the same, albeit richer and happier. He does create an elaborate system to track and correlate the 108 predictions, to try to see the big picture that binds them all together, but there is nothing to suggest how he has this ability. Most of the novel shows him making bad decisions and treating others poorly, because he can't keep his inner voice from being an outer one. The opening of the book also suggests a lighter tone and it bubbles up occasionally, but overall the story is dark, world-ending stuff, and I can't help but wonder if the cipher-like quality of Will would have been better-served with a more deliberately humorous approach similar to what David Wong uses in John Dies at the End (and related novels). Also, almost all of the supporting characters are unlikable. The subplot featuring the evangelist Hosiah Branson doesn't really pay off, except as a late punchline, and could have been cut entirely. The liberal use of fictional countries also undercuts some of the drama, because it starts to feel manufactured for the plot. And, though this is not something author Charles Soules has any control over, it's hard to imagine a president acting in a mature manner (the fictional President Green and various staff and associates play key roles as the story unfolds), given the destruction of the office by its present occupant. On the positive side, I was invested enough to keep going and the effects on the world of predictions destined to come true is played out in interesting, if ultimately bleak, ways. For me, this is an almost irresistible premise, story-wise, a kind of ultimate "What if?" scenario. Overall, then, The Oracle Year is recommended, with some reservations.